© Peter Howard, African Natural Heritage. 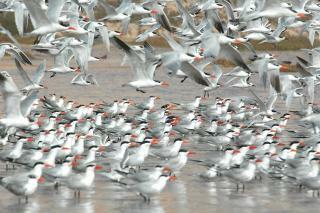 Banc d'Arguin National Park, between Sahara and Atlantic Ocean, is recognized mostly for its number of migrating birds. The park's vast expanses of mudflats provide a home for over two million migrant shorebirds from northern Europe, Siberia and Greenland. The region's mild climate and absence of human disturbance makes the park one of the most important sites in the world for these species. A wide range of species include flamingos, broad-billed sandpipers, pelicans and terns. Much of the breeding is on sand banks including the islands of Tidra, Niroumi, Nair, Kijji and Arguim. The surrounding waters are some of the richest fishing waters in western Africa and serve as nesting grounds for the entire western region. The global significance of Banc d’Arguin is incontrovertible – “Of the estimated seven million wading birds which use the Atlantic flyway, approximately 30% spends the winter at Banc d'Arguin, which hosts the largest concentration of wintering waders and one of the most diversified communities of nesting piscivorous birds in the world.” However, like most “wetland” WHS, it is primarily a destination for ornithologists who can give it the right amount of time and expertise at the optimum season of the year. The Park is huge and stretches along c30% of Mauritania’s coast. Its designated area is about 50% maritime and 50% land and a 4x4 vehicle is essential for the latter. The nearest asphalt is at the Chami entrance at approximately the mid point N-S. From there it is 30kms across sandy and often unclear tracks to the fishing village of Iwik which is the main place for hiring the boat necessary to reach the “banks” themselves where the main birding areas are. Any attempt to go north or south from Iwik can take you on tracks leading into dunes or areas inundated at high tides and having treacherous crusted surfaces. Our local driver drove these to the southern exit at Mamghar in order for us to see the Cape Timrit area. From there we had hoped to take the “classic” c170 kms “low tide” sea shore drive to Nouakchott but the tide times were not convenient and we had to “force” a route east out of the Park through dunes and across “virgin desert” to the asphalt road – this occasioned a rather surreal meeting with a passing camel herder to “ask the way”! He suggested a few degrees alteration to our “dead reckoning” bearing and was rewarded with a few cups of water before striding into the emptiness with only his camels (and no more water)! Entrance to the park in 2007 was 2400 Ouguiya per person (c $10 US) for 2 days, but the biggest expense is going to be the boat rental at Ou 20000 for a day’s boat hire – shareable with up to around 7 if there are any other tourists (we were alone)! Depending on his mood on the day, you might also have to pay Ou 3000 for the “obligatory” park guide to accompany you. We avoided this as he had “better” things to do! Whether his presence would have added anything useful I doubt – the boatmen are well aware of what is where and of the restrictions regarding access (which are significant – and even more so at nesting time). His presence would also prevent you from using a video camera during the boat trip. They are paranoid about this – a reasonable concern for “professional” equipment which should pay extra, but OTT for a small “hand-held” being used for “souvenir” purposes and certainly incapable of recording birds in any quality. However they seem unaware that the better modern digital cameras can take very acceptable video! We visited the park in early March knowing that this wasn’t the best time for “bird volumes” (November is optimum?) but were nevertheless a bit disappointed with the quality of what we saw and the general viewing conditions. A few days later we went south to the Senegal River (Just across the border from the Djoudj WHS – another “near miss” unfortunately!!) and easily saw most of the species from Banc d’Arguin (albeit at lower volumes) plus a large number of additional land and riverine birds. The camps at Iwik are not very good either, with a choice of 2, both of which are bleak, very hot and unappealing – the better option of a bivouac in the desert may not be allowed in the park? There are no hotels or guest houses. I have found it difficult to find an appropriate photo of the Park! That (top) of the whale skeleton next to the park office sign at Iwik is there “for the record”. Beyond that I could use a picture of Flamingos or Pelicans – but you can find much better on the Web taken with specialist equipment. Photos of the mud flats and desert do not really provide a statement which could be “unique” to Banc d’Arguin. 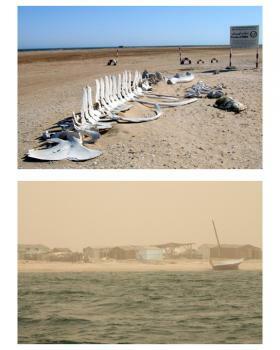 I have chosen therefore a photo (bottom) of “The approach to Iwik by sea in a sandstorm”! To me it captures place, time and mood!! It may be great for birds but this is a harsh environment for humans – you may question whether a visit is worth the effort! Natural sites with indigenous human population: 1000 or so Imraguen people live in the park, subsisting by fishing. Built or owned by Germans: Arguin was owned by Brandenburg/Prussia from 1685-1721. They built a fort there. Built or owned by Portuguese: The island of Arguin was controlled by Portugal from 1445 - 1633.